A period of intense stress, tension and negative energy has come to an end for the Aries zodiac sign with the beginning of 2014. The alignment of your planets has changed alleviating stress for 2014. You will find fresh energy and improved well-being. The Aries horoscope 2014 predicts that during this year change will be ongoing. All situations will be dealt with ease. A concern that has not been resolved will surprise you with the end result. Uranus is traditionally the planet of change. While Uranus is in your sun sign you will change hugely. Over the next five years you will need to make difficult choices. Changes can be caused in many things from illness to weather. This may be a time when you have the opportunity to completely veer off into a new direction. As you do new things a greater level of maturity will show your real personality. The Aries 2014 love predictions forecast that a cautious approach to romance is necessary. The associations with both friends and lovers will be significant. Richness in these relationships will be increased by a strong spirituality. Consider carefully before beginning new connections. There is a strong probability that your family will provide for you in 2014. Joy in life will mark the year and perhaps a new home is around the corner. Work hard to be able to enjoy. Your spiritual aspects will be wakened by Neptune. Your instincts will guide you in treatment of family and friends and those near and dear to you. A time of testing in the work world begins in 2014. You will benefit greatly from this time. An essential element is telling yourself the truth so that you may feel you are progressing. Your career forecasts for 2014 predict that you will accomplish much without considering others’ opinions. Pluto will have a strong effect on your point of view and put forth your talents. You will either fly or fail. The level of effort you make will determine your success. You may enter a new field thanks to Uranus. To manage the necessities, Aries, money is a requirement. It is by working that you will gain money. You may seek to have fewer things but only the most important things. While care is needed, a considered gamble may be worthwhile in regard to money as predicted for Aries in 2014. Health astrology predictions foretell that proper care and regularity is the watchword. 2014 seems to be enjoyed as you look to complete everything that you have dreamed. 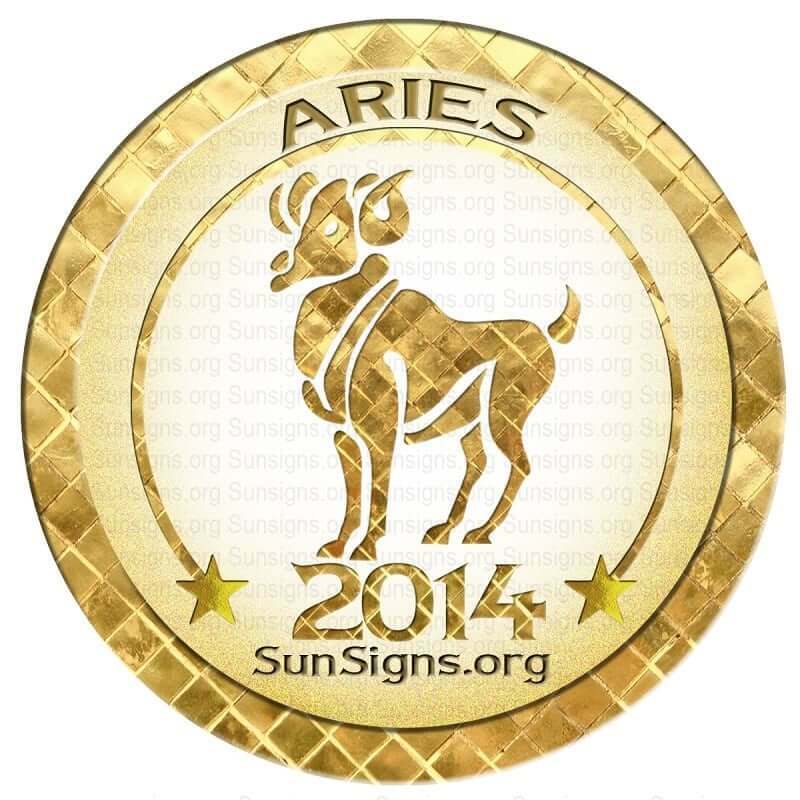 Be guided by the 2014 Aries horoscope and enjoy success throughout your life. Let the coming year be a happy one for you! January will be a month of progress and positivity. Excellent career changes are seen. February will see new financial opportunities and good communication with family. March will see you taking many risks that might prove to be futile. In April you will need to focus more on achieving your goals rather than just marching ahead. May will have the Mercury retrograde affecting your decisions. Health will be good. Fulfill your family obligations in June since career and finance will be weak. July 2014 will be a stressful month for the Arians. This is a good time to take a break. August will be a month of good finances, progress in career and excellent health. You might get into some altercations in September. October is the right month to start planning for the future. November will be a prosperous month in terms of finance, love and health. In December you might have changes on the career front. Try to be less aggressive.